Valerio Agnoli (born 6 January 1985) is an Italian road bicycle racer for UCI ProTeam Astana. Agnoli was one of the key domestiques for the Liquigas cycling team, where he was often instrumental in victories for Ivan Basso and Vincenzo Nibali during the Giro d'Italia. 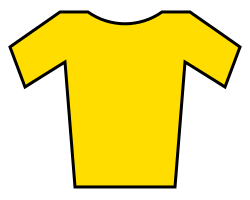 Agnoli had a very successful junior and amateur career, taking victories in many prestigious Italian races, including the famous Giro della Lunigiana. Agnoli wore the white jersey for the best young rider during the 2010 Giro d'Italia, before a crash including his team-mates Ivan Basso and Vincenzo Nibali caused him to lose it. Agnoli left Liquigas–Cannondale at the end of the 2012 season, to follow Nibali and join Astana on a two-year contract from the 2013 season onwards. 1 2 "Nibali signs two-year contract with Astana". Cycling News. Future Publishing Limited. 2 August 2012. Retrieved 2 August 2012. 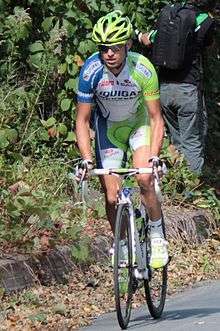 Nibali will take two of his Liquigas Cannondale teammates with him, Valerio Agnoli and Alessandro Vanotti. ↑ "Cavendish wins the Clasica de Almeria". cyclingnews.com. 15 February 2015. Retrieved 17 February 2015.